Learn about the signs and symptoms of trigeminal neuralgia. Learn how trigeminal neuralgia is diagnosed. Learn about the treatment for trigeminal neuralgia. Learn about follow-up care for patients with trigeminal neuralgia. Trigeminal neuralgia is treated by a multidisciplinary team at Lehigh Valley Health Network, comprised of neurosurgeons Stefano Camici, MD and Mei Y. Wong, MD, along with radiation oncologists Alyson McIntosh, MD, and Robert G. Prosnitz, MD. Learn more about how LVHN neurosurgeons and radiation oncologists use Gamma Knife technology to treat trigeminal neuralgia. Mark Li, MD, PhD, leads a multidisciplinary group of brain tumor specialists who work together to destroy certain tumors that were once considered inoperable, while doing everything they can to preserve healthy brain tissue and function. Most common over-the-counter and prescription pain medications do not work for people with trigeminal neuralgia. Anticonvulsant medication – While anticonvulsant medication is traditionally used to prevent or stop seizures or convulsions, for trigeminal neuralgia patients, the effect of anticonvulsant medication is to relieve pain. Tricyclic antidepressants – Typically, this is a type of drug used to treat depression. However for trigeminal neuralgia patients, tricyclic antidepressants help relieve pain. Acupuncture - The technique of inserting thin needles through the skin at specific points on the body to control pain and other symptoms. It is a type of complementary and alternative medicine. Biofeedback - A method of learning to voluntarily control certain body functions such as heartbeat, blood pressure and muscle tension with the help of a special machine. This method can help control pain. Surgery is considered when more conservative treatments to alleviate pain caused by trigeminal neuralgia have failed to provide relief. For questions about brain surgery or Gamma Knife or for a referral to a doctor on our treatment team, please call 610-402-CARE (2273). 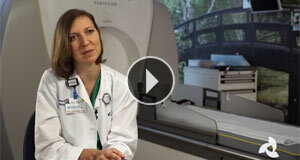 Stereotactic radiosurgery using the Gamma Knife® Perfexion™. This type of surgery does not involve cutting. Instead, focused beams of radiation target the spot on the brainstem where the trigeminal nerve exits. The radiation causes a lesion to form, which interrupts the transmission of pain and other sensory signals to the brain. Patients report a gradual improvement in symptoms over weeks or months following stereotactic radiosurgery. Microvascular decompression surgery involves reaching the trigeminal nerve through the skull. Once the trigeminal nerve is isolated, the neurosurgeon gently moves the blood vessel that is pressing on the nerve. A biocompatible cushion is placed between the nerve and the blood vessel to stop the vessel from pressing against the nerve.